This past week I bought an eggplant, figuring I’d do something with it because I like eggplant and it looked good in the grocery store. I try to buy the best looking produce I can find and decide meals from there. So that was the extent of my planning. 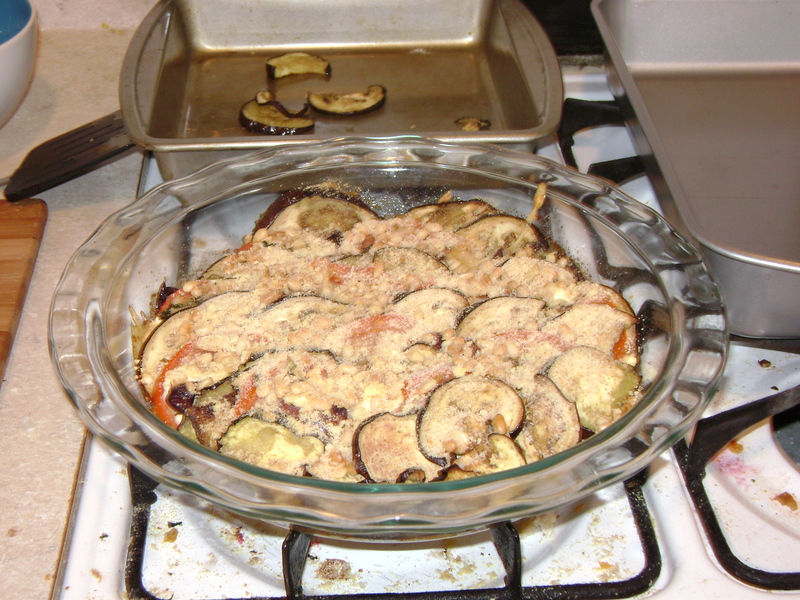 I was vaguely considering making ratatouille, cause I’ve never done that, but then I found the perfect recipe: Eggplant and Tomato Gratin. I say it was the perfect recipe because I magically had everything it calls for, down to the pine nuts and the mint, which was at the “use me or throw me out” phase of existence. Since I’ve linked to the recipe, I won’t go through the minutia of how to prepare it, just my adjustments. Well, I lied when I said I had everything. I didn’t have feta cheese. I’m not a big enough fan to buy it instead of other cheeses unless I have a very specific reason. But I had four other kinds of cheese. I settled for a soft goat cheese mixed with mozzarella, and it worked extremely well. For the topping, I didn’t bother toasting the pine nuts, because, why bother? And I added some parmesan cheese to the topping as well. I do that for most toppings, mix parmesan in with the bread crumbs. Genius idea my dad taught me. Layering the gratin properly is one of those things that seems weird, and then you do it, and it suddenly makes sense. Only annoying thing is that this thing takes a while to make, between the eggplant prep and the final baking. Although, I just baked it for 30 minutes at 350 at that worked perfectly well. The recipe was awesome! At least if you like eggplant. The mint and the goat cheese added really interesting notes, without being overly noticeable. The only issue is that, if you reheat it in a microwave, it loses its crispiness, which can be unfortunate. Ideally you should reheat it in an oven. Sadly the kitchen at my job doesn’t have an oven so … This kind of meal can be served with basically anything, but wine is better than beer for veggie casseroles as a general rule. I paired it with a glass of vinho verde, a Portuguese white wine, but I’m sure most wines, red or white, would go nicely with it.